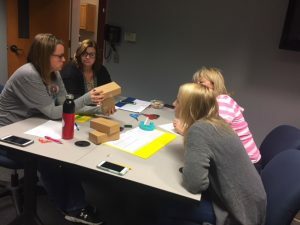 On October 4, 2018, ESU 11 hosted a Professional Learning Community meeting for second and third grade teachers. PLCs are an ongoing process in which educators work collaboratively to achieve better results for the students they serve. During this session, the group reviewed the newly adopted College and Career Ready Science standards and 3-Dimensional Teaching. Kate and Jody then helped the teachers identify where the Nebraska CCR Science standards are taught in the school’s current science textbooks, and provided resources to help address those gaps. During this procedure, teachers held professional discussions and identified gaps in the curriculum. ESU 11 Gifted Coordinator Janelle Jack engaged teachers and demonstrated how to integrate engineering components into a lesson. The next PLC will be held in January. Between now and the next meeting, teachers are encouraged to integrate one of the lessons that was developed in their classroom during a science lesson.